With the Recital 18, Bovet owner and creative engine Pascal Raffy set out to create the ultimate traveler’s watch by adopting the most ancient principles of timekeeping, the observation of the stars in relation to the Earth and the journey of the moon around the Earth. But Raffy and his watchmakers didn’t stop there. The watch combines a five-day tourbillon, a hemispheric worldwide time function with selectable time zones, a compact 24-cities indicator on rollers, a hemispheric moon-phase display, and timekeeping by means of a jumping hour with retrograde minutes. The spherical globe representing the Earth is seen as it would be from outer space, as one hemisphere, i.e., half the surface. 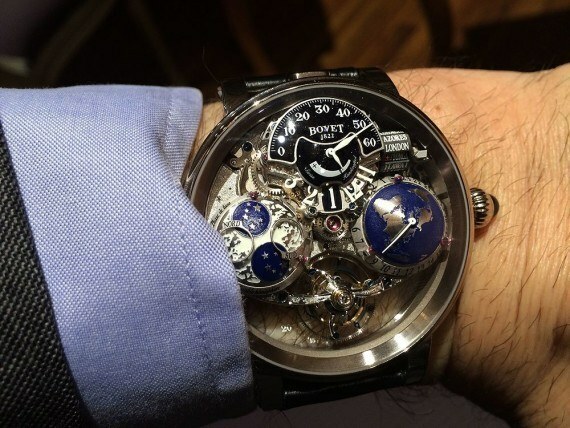 Bovet enlisted the aid of a cartographer to design the 3D globe, which is positioned at 3 o’clock. This hemisphere enables the reading of universal time, using a curved hand affixed to the North Pole in the center, which follows the contours of the globe. The user can position the hand at any of 24 selected time zones. A concentric ring at the tip of the little hand displays the time in the chosen time zone, while the name of the city corresponding to that time zone appears on one of the two concentric rollers that are indexed to the hemisphere. At the same time, the user can easily read the time anywhere else in the world on the 24-hour ring that surrounds the globe by simply imagining a straight line from the center of the globe, passing through the selected geographical point, to the numerical time indication on the graduated ring. To link the hand of the second time zone to a specific city, simply press the center of the winding crown, which makes the needle jump by an angular value of 15°, representing the exact value of the time zone. With each successive jump, the rollers and the names of the cities corresponding to the time zones indicated by the hand also change. The system of concentric rollers to indicate the cities — which is cleverly controlled by a column wheel — offers the two-fold advantage of taking up little space while providing exemplary readability. Here’s how it works: the outer roller displays 11 cities simultaneously, then is interrupted by a window offering a view of the second roller, arranged concentrically inside the first, which displays the names of time-zone cities 12 through 24 in the aperture as the wearer cycles through the time zones. The mechanism required extremely precise adjustments, including a patent-pending constant-force correction device, which ensures that a measured and constant flow of energy is transmitted to the mechanism when the user releases the pressure on the corrector. The cylindrical rollers are designed for optimum readability, treated in black rhodium with the engraved city names lacquered in white. Opposite this complex universal time display, and complementing it, is another hemispheric indicator for the moon phases. A pair of curved circular apertures follow the curve of the 3D moon to indicate the age of the moon as seen from both the northern (“NORD”) and southern (“SUD”) hemispheres. In this unconventional yet intuitive display, the moon and the starry sky succeed each other in both windows. The moon-phase indicator is, of course, driven by a highly precise mechanism that only requires correction by one day every 122 years. Both hemispheres, for universal time and for moon phases, are machined in a single piece and their surfaces enhanced with relief engraving. The “ocean” areas are then filled with luminescent blue material and the craters on the moon with white luminous material, while the areas representing sky and space glow a deep blue in darkness. The watch’s most basic functions — its hours-and-minutes time display and power reserve indication — reside at the 12 o’clock position, though here, too, we find a high level of complexity, and a three-level construction that creates in essence a third hemisphere on the watch’s open-worked dial. These curved dials, which are manufactured in-house, are available in white or in aventurine. Also, travelers will appreciate the ease of this timekeeping system: simply press the push-piece at 12 o’clock to adjust the hour disk without affecting the minutes, seconds, or any of the other myriad of functions. The five-day power reserve is stored in two barrels and controlled by a tourbillon balance oscillating at 21,600 vph. The movement, hand-wound Caliber 17DM01-HU, is equipped with Bovet’s Dimier escapement and regulated by a hairspring manufactured in-house at its Fleurier manufacture. The one-minute tourbillon features a triple seconds-hand, unconventionally placed under the tourbillon and following a subtly tampoprinted graduation inside the crystal, for a clear and original display. 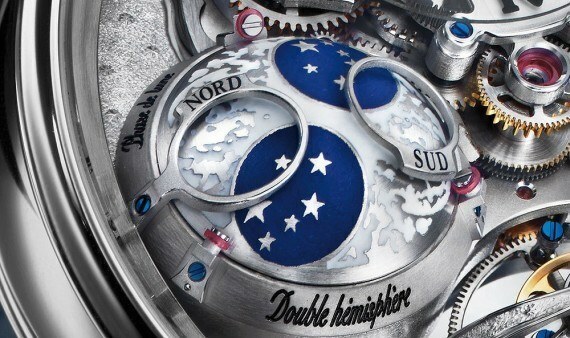 An entirely hand-engraved constellation of stars extends across the entire surface of the movement; a moon phase is reproduced on the back, along with two entirely hand-engraved hemispheres evoking the Earth and moon. The carriage and tourbillon bridges are also entirely hand-engraved, despite their delicate nature and the tiny amount of surface area available. This innovative and technically intricate movement, for which two patents have been filed, necessitated an entirely new case structure. 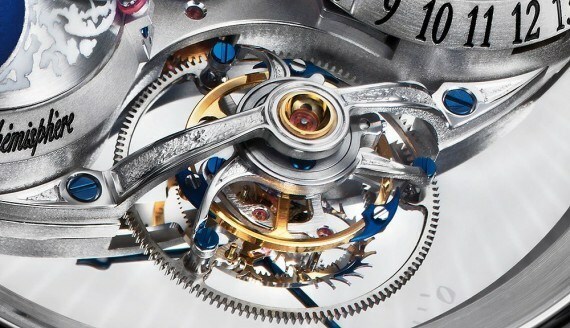 The incline that defines the movement between the top of the minutes dial and the tourbillon, and the use of the protruding domed hemispheres, required not only a domed sapphire crystal with a very pronounced curve but also a case middle that follows a pronounced oblique incline along the 12 o’clock to 6 o’clock axis. In all, there are seven domed elements present in the watch’s construction, including the four hemispheres of the movement, the dials, the tourbillon carriage, and the front crystal. The Bovet Recital 18 “The Shooting Star” comes in a 46-mm case in white or rose gold (18.15 mm thick) and is outfitted with a black or brown full-skin alligator strap with an ardillon buckle matching the case material. It is a limited edition of 50 pieces and priced at 295,000 Swiss francs. If you’re wondering what this stellar example of haute horlogerie actually looks like on the wrist, check out the photos below.